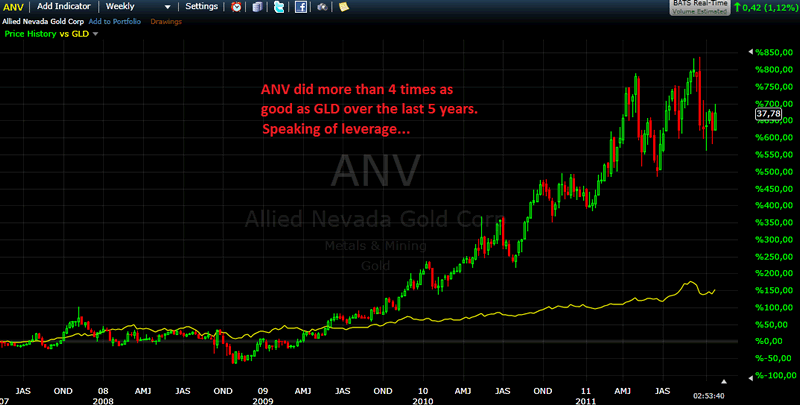 Gold Miners’ Leverage Effect Is Gone. But For How Long? In this article, we will have a look at the so called “leverage” effect that mining companies are supposed to have to the underlying metal prices. To explain briefly why mining companies SHOULD have a leverage effect to increasing metal prices, I will illustrate this with a simple example. Suppose you have a mining company X.
X is mining gold, which is trading at $300 at the moment. However, the company has to pay its employees, has to pay for exploration of the mines, it takes a lot of money to build the mine, and so on. Assume it costs $500 to mine one ounce of gold. Initially, the company will make a loss of $200 for each ounce of gold mined. 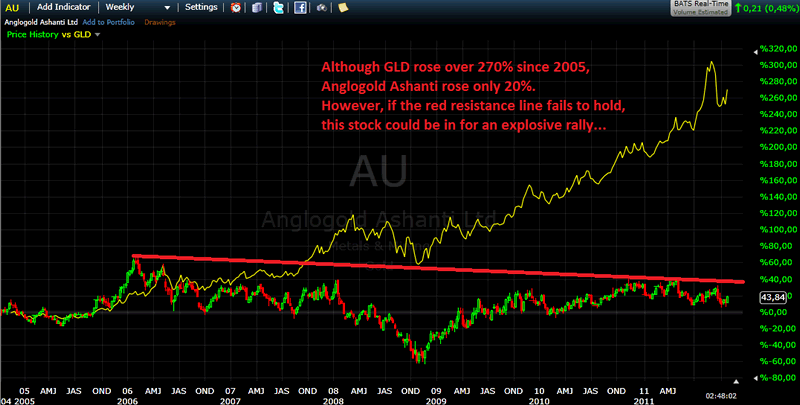 However, when the gold price rises to $500, the company will break even. With a gold price of $600, the company will make $100 profit for each ounce of gold mined. Now here is the key: if gold rises now from $600 to $700 (16.66%), the profits will rise from roughly $100 to $200, which is +100%! 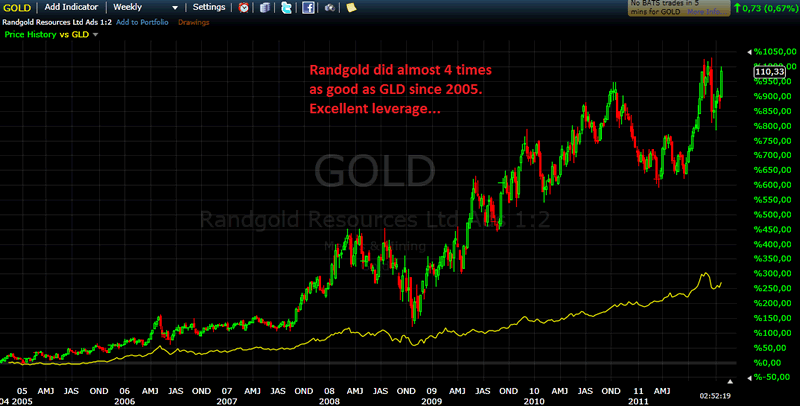 So even though the price of gold rose only 16.66%, profits doubled. 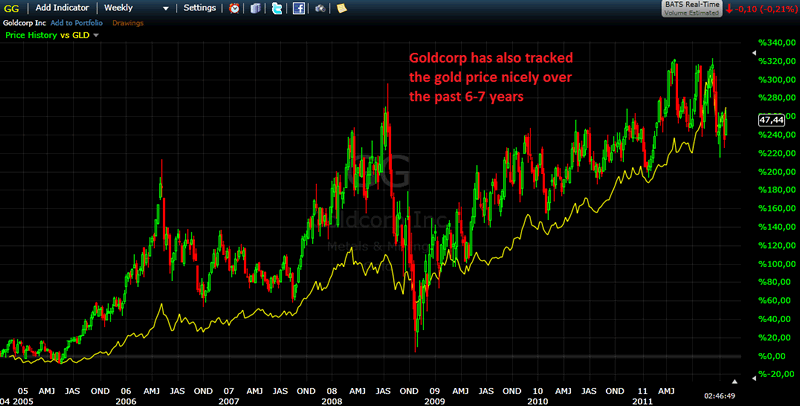 So each $ increase in the price of gold, will lead to more profits for the company. When profits soar, the stocks are also expected to soar. However, of what we have seen in recent years, it looks like this is definitely not always the case. The kind of companies shown above, seem to be rather an exception. 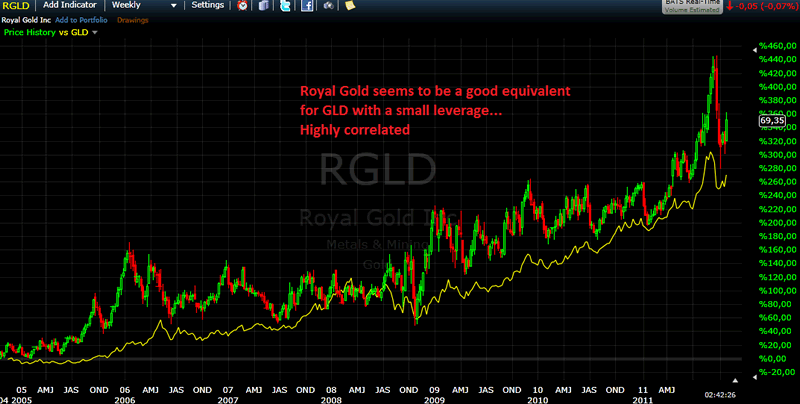 Some other gold mining companies have performed equally to GLD, such as RGLD (Royal Gold) and GG (Gold Corp.). However, as a result of the financial crisis in 2008, most gold stocks got beaten down so much that sentiment is so bearish, that it looks like these companies will never be able to increase profits or cash flows from their operations. 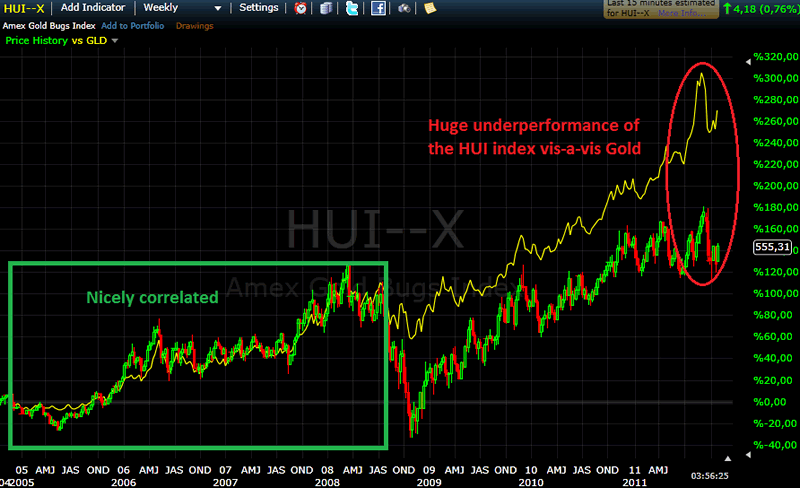 When we look at the HUI index, we can see that from 2005 until 2008 (right before the financial crisis), the price of the HUI index was highly correlated with the price of Gold. However, recently, the HUI index has been lagging the price of Gold in a way that asks for a huge rally of mining stocks, or a huge drop of the Gold price, or a mixture of both. This can’t sustain in the long term, and with gold now being in a favorable position, we think the HUI index will play catch up with Gold. 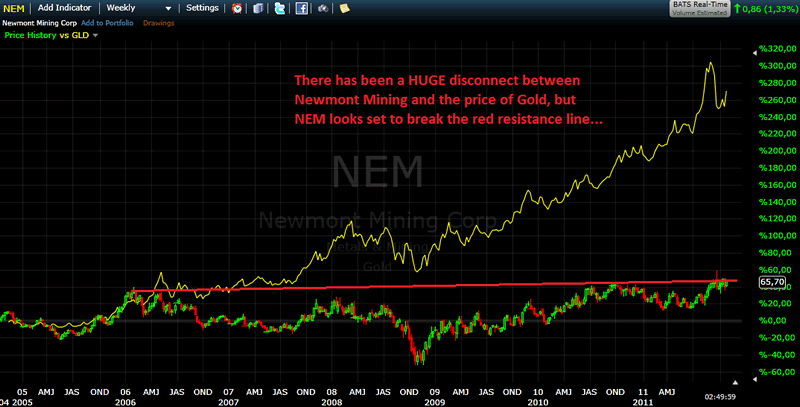 To give you one particular example of a stock we mentioned above, we take NEM (Newmont Mining). NEM is now trading at about 3.8% of the price of gold. In order for the ratio to go back to its historical average of about 8%, NEM could more than double, even if Gold would stay flat. Conclusion: Although the mining stocks should have a leverage effect to a rising price of the metals they have in the ground, we can see that because of the financial crisis this leverage effect has often disappeared. However, with the crisis in Europe only worsening, and the US on the brink of financial disaster, we think it’s just a matter of time before the rating of the perceived “safe haven US Government bonds” will be lowered again. When this happens, investors have nowhere to go but GOLD. When the mass finally realizes that the mining stocks are severely undervalued, the mining companies could start a rally like you will only see once (or maybe twice if you’re lucky enough to become old) in your life.